If you tuned in late, you can read Harry Poole's full match report on this game. All the games in the other football leagues are under way too. And ahead of tonight's big match between Chelsea and Liverpool, there's some thoughts on Roberto Firmino by Steven Gerrard and a piece from Phil McNulty on how Chelsea have been transformed by Maurizio Sarri. If you're a West Ham fan, you'll want to tune into Match of the Day on BBC One from 22:30 BST this evening to catch all the highlights from this game. "We hope in the future to have a lot of these days. Today was the test we needed to prove we can play as a big team. Not just to get a result defending against United or City or Chelsea. We work every day. That to me more makes me happy. "The team is making a difference, the players delivered a big performance. Not just one player. Delcan Rice is doing well, still to improve. We had good possession and worked well as a team. "The problem with Marko for the defence is with that power, in five or six runs during the game, one he will win. In front of the goalkeeper he is finishing well so a problem for every defence. "I want a team that defends with 11 players and knows how to defend. The back line has improved a lot. "I think we need to beat Brighton, that’s the next game. If we think because we drew against Chelsea and beat Man United we will beat Brighton that will be a big mistake. We need to improve more to have successful season." More from Jose Mourinho, speaking to Match of the Day: "When we scored the goal to come into the game, they scored right after and this was the referee mistake because there was a foul on Marcus Rashford before." On West Ham's win: "When you are winning and you are full of confidence that is the best victory you can have. One goal is offside, the second goal is own goal and the third goal is referee's mistake but for the next game we have to have a better start." On Paul Pogba and his unhappiness within the team set-up: "He's trying hard." More from Mourinho on leaving Alexis Sanchez out of the squad: "Look, for how many months people are asking for Martial and Alexis Sanchez is not playing well enough so this week it was time for me to agree so I picked Martial and left Alexis out." On his team's overall performance: "I can have complaints with quality and mental approach. You have to try always and that is my nature as a football professional." Jose Mourinho speaking to BT Sport: "Well I think a team that comes with that agility and after five minutes, 1-0 down is not the best way to start. It was a little offside but maybe the linesman did not see and made a mistake. "For the second goal, we know Andriy Yarmelenko is very left-footed and we are not aggressive enough to contest that shot. Second half we took a bit of time to react but we did and the goalkeeper made a few good saves. Congratulations to the scout that found these 21-year-old kids, Issa Diop is a monster. "The third goal killed our mentality because the referee did not see the foul before. We had 20 minutes to try and change the game after we scored but we could not do it because our mentality was gone." At Manchester United I think it is everything that is contributing to their problems. Is it the players? Possibly. The manager? Possibly. The board? The fans? Possibly. It is not one thing that has derailed United as a club. But I think it is curable. "To be honest the way it’s going at the minute, Man United could have lined up a number of ways with all their talent. "But we worked all week on how we play. We've had good results and confidence is high. You can see how we played, we didn’t come here to stay in shape, we came here to win and you could see that from the first minute. 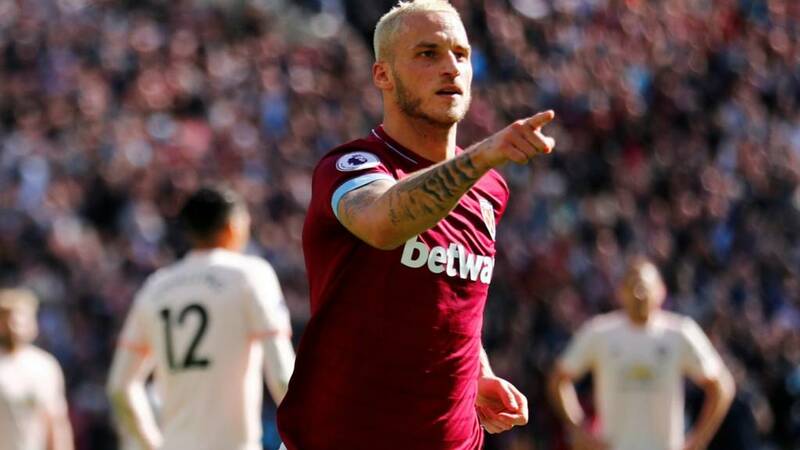 "Man United are a dangerous team, so they have the ability to get one, but as soon as I slipped through Marko [Arnautovic] I thought he would score. "He hasn’t trained much, only one or two days, so to run like that shows he is working hard for the team. The performance was great especially for the fans who have come here seen some bad ones. "Days like the Chelsea game where we could’ve had a couple of goals, today, the 8-0 win over Macclesfield in midweek. We’ll lose games and play bad at times, but the way manager has us playing, you see the confidence." Jose Mourinho has just spoken to BT Sport. He says people have been asking for Anthony Martial to be given a chance for "months and months" ahead of Alexis Sanchez. He says he decided to give him a chance. West Ham beat Manchester United by a 2+ goal margin in a league game for the first time since October 1982 (also 3-1). Manchester United have scored three Premier League own-goals in 2018, more than any other side. David De Gea has kept just one clean sheet in his opening seven Premier League games this season having kept six shut-outs in his first seven last season. In 2018, only Liverpool’s Mohamed Salah (24) has been directly involved in more Premier League goals than Marko Arnautovic (17 – 10 goals, 7 assists). "I doesn’t matter how they set up, our game was to try to win, we have to do our job and we did it excellently, and that is why we deserved to win. "I think I’m there to help the team, to hold the ball and score goals. I’ll try to do everything possible. "I have nothing to say [on Mourinho]. I look at my team, whatever the other team is doing is not our stuff." Disjointed performance from Manchester United but let's not talk about them, let's talk about West Ham because they've been superb. Their inter-play and Mark Noble was immense and my only worry is what happens if they lose Arnautovic but let's take nothing away from them today. They deserve all three points. James Hulme: Time to go Jose. Just sack him. Refuses to change, blames everyone else. Former Manchester United defender Rio Ferdinand, speaking to BT Sport: "As a a footballer your DNA is about hard work and effort. I didn't see that today. I didn't see them make two or three passes in succession - that's criminal. I don't see enough players working hard to say to the manager 'this is my place in the team'. You've got to work hard and grind and Man Utd didn't. "There are some big decisions to be made at Utd now. There will be conversations at the top level, about the future of the manager and the squad, because the basics are not being done. There has to be something said." Plenty of praise must be given to West Ham. They deserved their victory today and were the better team from the off. Hard work, determination and terrific organisation. A huge improvement from their opening game of the season when they were thrashed 4-0 by Liverpool. Plenty of criticism for Jose Mourinho following another Manchester United defeat. But there was a World Cup winner in that starting line-up, along with big stars like Romelu Lukaku, David de Gea and Nemanja Matic. Do the players need to take more responsibility? We'll hear from Jose and some of his players shortly. Victory over Everton and Manchester United. A draw with Chelsea. And an 8-0 thumping. Great fortnight for West Ham. But Manchester United are in deep trouble.